When an inactive member returns to the club, you can reactivate them making use of the Inactive Members List. This situation can arise when a member takes a leave of absence for illness, travel or other reason. 1. To access the Inactive Members List, you must go to your club homepage and log in. Then, click on Member Area near the top right of the page. 5. To view and edit currently inactive members, click the Inactive Members List link under the Members header on the left side. 6. Here, you can view and edit the details of all your inactive members. In order to reinstate a member, click on Change Status under the Action column. 7. This takes you to the change status screen. It now gives you three choices. Click Active Membership. Membership Type - This is what type of membership the member would be changed to. Date Joined Club - This is the member's rejoin date. Date Joined Rotary/Organization - This is the first date when the member joined the organization. Check Box - This is only for Rotary Clubs. 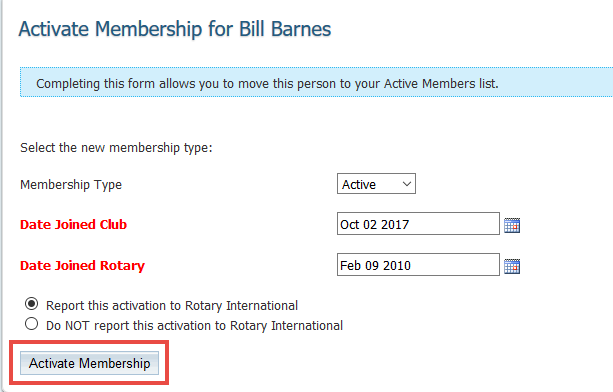 If you do NOT want to notify Rotary International about the change click on this check box. Once done, click Activate Membership. The member is now active. To further edit their profile, look them up in the Active Member List.